When Michele and David Tully moved into their Alabama home in 1994, the kitchen was one of their favorite parts of the house. 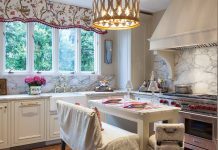 But after 23 years of trying to work around an inconvenient layout, the couple decided to create a kitchen that would lend itself to the time-honored Southern tradition of gathering around a good meal. Since David is the owner of his own renovation company, he and Michele had a good idea of what they wanted to see in the new design. “We entertain a good bit, whether it’s church or family or friends,” Michele says, pointing out the need for good flow and plenty of room for food. They teamed up with local architect Carrie Taylor and cabinetmaker Phillip Wentzell, and the finished product includes a center island that addresses both needs. The island’s neutral-toned base reflects the original color choice for the cabinets, which changed when Michele found herself drawn to brighter options. 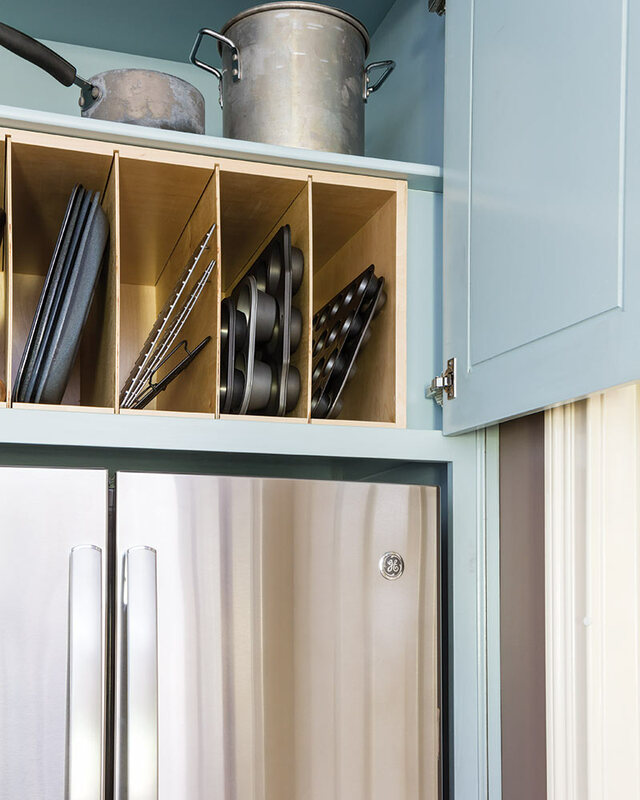 On a whim, she made the decision to paint the pantry blue. 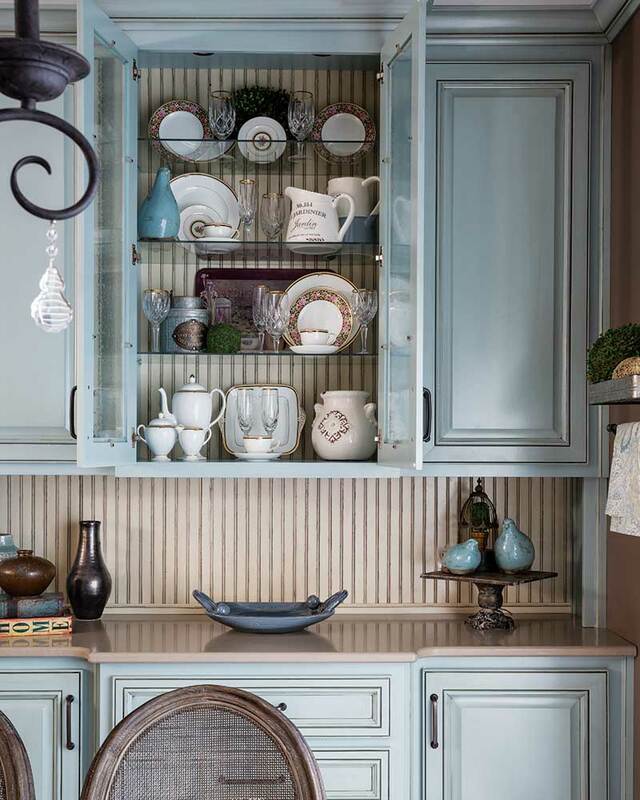 “After we did it, I saw it and I said, ‘I want all my cabinets blue,’” Michele says. An antique finish ties the two paint colors together while adding a note of French country style. 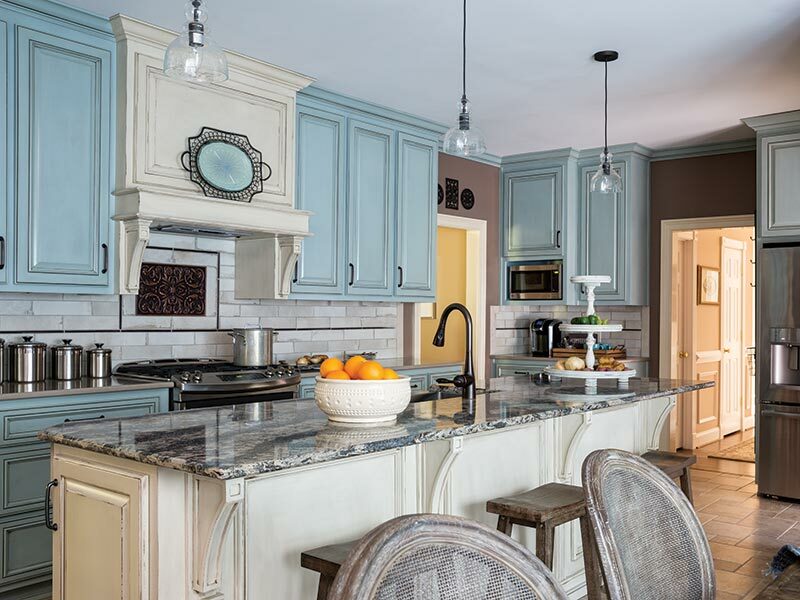 The Tullys’ kitchen color palette offers a refreshing change of pace from traditional dark wood tones and more popular bright white rooms. 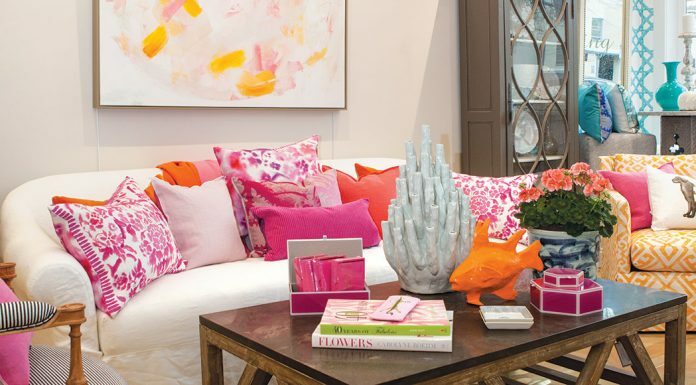 It’s the soft blue hues and warm honey tones that welcome the chilliest season with a warm hello. While this Southern kitchen may witness only a handful of snow days, the thoughtful design invites a wintry charm. In addition to creating a cozy aura, interior designer Robina Keith selected the blue to draw out the tones in the Cambria quartz island countertop. The island top was the first piece that the Tullys decided they “had to have” in the renovated space, and the Silestone perimeter countertops were chosen to blend with it rather than take away from it, according to Michele. 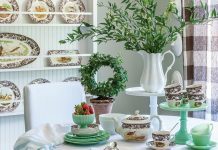 The built-in china cabinet’s glass doors display an assortment of glassware, including pieces from the Tullys’ wedding set, along with newer items chosen to match the fresh design. “[Robina Keith] took a lot of time and worked in some of my crystal and some of my china so that I had some of it in there, but with a lot more interest,” Michele says. The beadboard back-splash from below continues upward to create a textured backdrop for the collection.